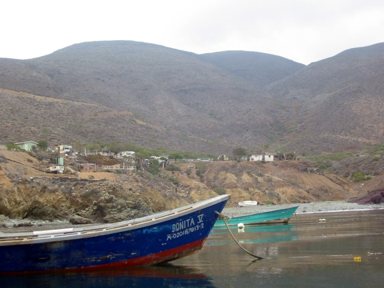 This is a short report with photographs regarding a trip to Santo Tomas, Baja California. 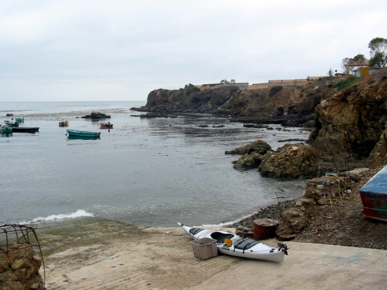 We departed San Diego on Dec 10th and drove to Ensenada via Tecate BCN. 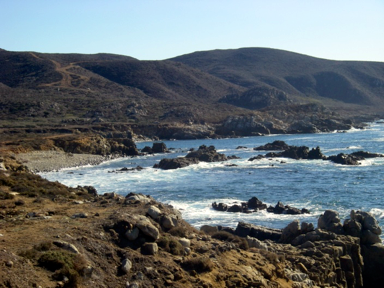 The intent was to paddle out to a small group of rocks offshore called Rocas Soledad which are a known haul out for California Sea Lions and to count them and to examine as many as we could for evidence of physical damage from plastics and fishing gear. The trip was undertaken over 4 days with 2 days being spent on site. Seven counts were made by two observers and a total of 69 (plus or minus 9) Sea lions were counted. None showed any evidence of physical damage from fishing gear, nets or Monofilament line. 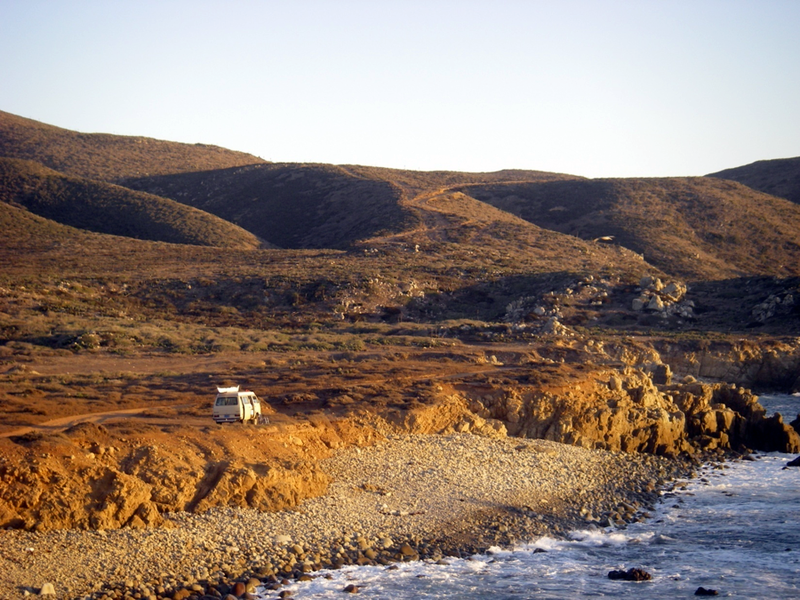 Santo Tomas is a small fishing village 40 kms south of Ensenada, Baja California in Mexico and 29 kms out to the coast on a dirt road. There had recently been a rain event which had put over 8 cms of heavy rain into the small valley. In some places there was over 30 cms of mud. It took about 6 hours to cover the 29 kms to the coast due to the hard going. We spent a total of 3 nights camping in the Santo Tomas Valley. 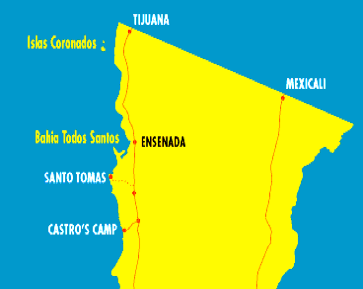 It should be noted that the settlement in this valley antedates the city of Ensenada by some 150 years and that at one time this was the only Hispanic settlement on the west coast of California south of Monterey. 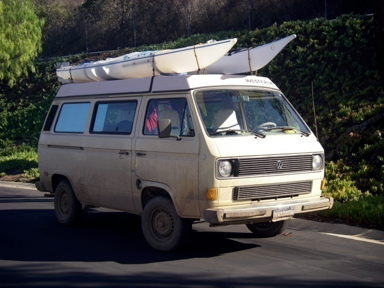 The trip was completed with the aid of a Volkswagen Vanagon and 2 Polypropylene Ocean Kayaks. 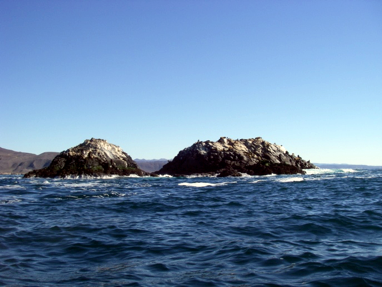 Rocas Soleded seen from Punta Riff, a small headland about 3 kms north of Santo Tomas. 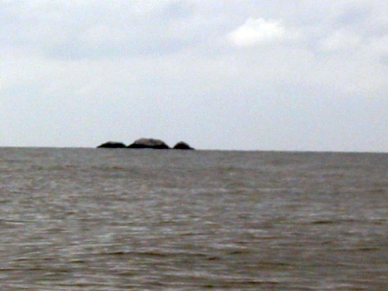 Rocas Soleded are about 1.5 kms offshore. They do not appear on the current DMA chart for the area but do appear on some local charts. The paddle out to the rocks takes about 40 minutes headed just about due West (270 degrees Mag) and sea-lion observations were began at about 1000 hrs. 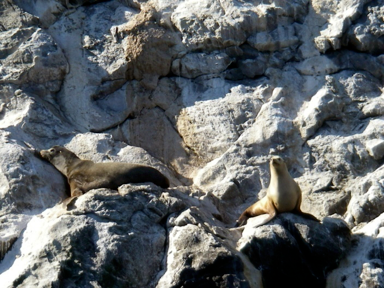 Sea-lions were evident on all three rocks . Evidently the rocks have been a haul-out for millennia as the base of all the rocks show evidence of smoothness and rounding that comes from continuous use by Pinnipeds. This is similar to other Sea lion haul-outs observed on Los Coronados Islands and Guadalupe Island BCN. 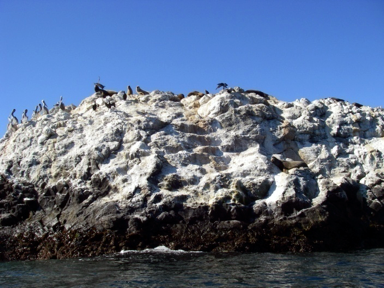 Roosting populations of Brandt and Double-Crested Cormorants have covered the rocks in an abundant layer of Guano.This thick white material indicates that a goodly quantity of small fish are available for sea-lion predation locally. Several Black Vented Shearwater were observed flying offshore and identified by their characteristic “Flap -flap – glide” flight pattern. A total of 7 counts were made over a space of 45 minutes which resulted in a population count of 69 (plus or minus 9). 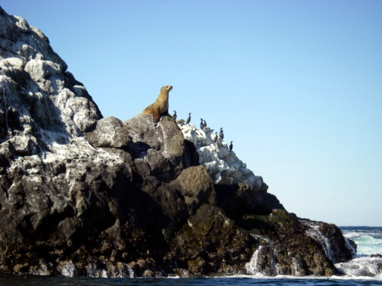 All of the Sea Lions were observed closely through 8x 20 binoculars for damage from fishing gear and nets and no damage was observed.The sea-birds were also examined for signs of fishhooks and monofilament line in their beaks and wings and none was found. 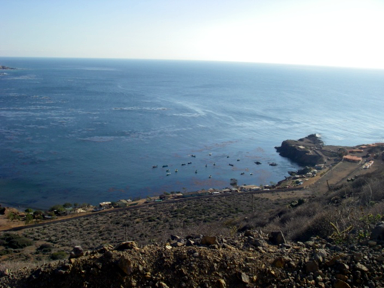 The return journey was made through and over some very extensive Kelp beds that border the Santo Tomas Bay. The second day was spent doing a search of the coast between Punta Riff and Puerto Tomas (5kms) looking for evidence of Sea lion haul-outs on the mainland. 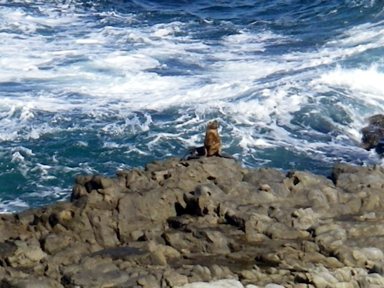 Only 1 sea lion was observed on the coast however there was much evidence of sea-lion haul-outs. 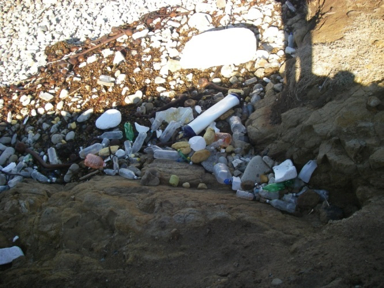 Regrettably, a small beach at Punta Riff was discovered to be completely inundated with plastic debris ranging in size from a block of Styrofoam nearly 1 meter cubed to small bits of Styrofoam < 1 cm. It included plastic bottles, fishing floats,old footwear, medical waste and miscellaneous plastic rubbish. The weight of this material was estimated at 30 kg. This debris was collected and destroyed in a fire. In retrospect it would have been better to have collected it and disposed of it in a landfill but access to a landfill was 120 Kms away and that landfill is merely a place where rubbish is buried in a river valley with no precautions taken to prevent to materials leaching into the groundwater.The photograph represents only a small portion of the total plastic found. 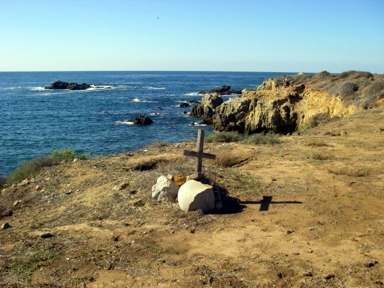 A small lonely gravesite was discovered out on the headland at Punta Riff with the date 3-18- 1913 carved into the crosspiece. 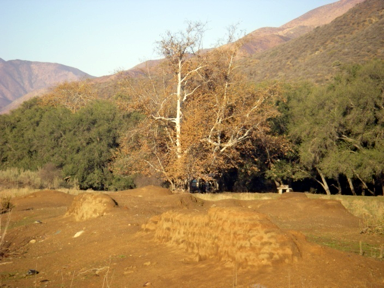 On the right is the remains of the adobe walls of the Dominican Mission do Santo Tomas de Aquino several kilometers inland. On the return journey 1 night was spent camping near the washed out remnants of the Dominican Mission which was founded in the Santo Tomas Valley circa 1760 and abandoned some 60 years later. The adobe walls stand about3/4 meter high. During a short search of the area we discovered what must have been the walls of the old kitchen garden marked out on the level sward. Just for fun the magnetic compass alignment of the mission was measured and found to be 88 degrees true which indicates that the Dominican Padres were pretty close in their choice of alignment for the Mission. The return journey took place on December 14th. This entry was posted in Trip Report on December 24, 2015 by Robin Kedward.